Internationally known sculptor Mark Di Suvero 's brightly colored "Proverb" has a pendulum element that moves. sculpture is in the far background, to welcome guests and salute the arts. lots. Small groups in a comfy Mercedes van enjoy the tour. THE APPROACH to Tippet Rise Art Center is through Montana's heartland. This is cattle and sheep country. Both of those safely graze in a landscape marked by harsh winters and blazing summers. A working ranch as well as internationally known arts venue, the land is tended as it has been for generations by people who know nature's wonders and cope with its sometimes unforgiving twists. DEER DART across the fields in search of summer grass to browse, and the bird life is extraordinary. Songs of sandhill cranes echo in the valleys while hawks, eagles and dozens of smaller birds vie for attention. Their music is a fitting prelude to extraordinary concerts held summer weekends in a small, European inspired concert hall, the multi-million dollar "Barn." There's an outdoor performance venue, too. Yet the music is not the only attraction on the varied bill. in Montana were needed to hold the two sides in place for fastening. 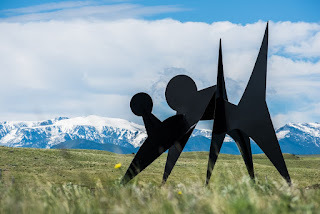 As one wends her way up the road from Fishtail, Montana, the terrain gives way to a surprise: could it be a sculpture by Alexander Calder? Indeed it is -- on loan from the Smithsonian's Hirshhorn Museum and Sculpture Garden in Washington D.C. The monumental piece greets visitors, one of two Calder works loaned to the Montana venue. The other is a lyrical mobile which hangs above the concert area in the Olivier Music Hall. inspired piece of 400-ton art. of a well used and loved structure. It is a popular attraction for visitors. the first art they see, as it was for years at the Hirshhorn. IT IS FITTING that contemporary masterpieces greet visitors headed for a concert. The land was once home to impressionist artist Isabelle Johnson who like the center's creators, lived in many worlds, traveling to Paris, returning to her roots. Connecting art, music and landscape is the goal of Tippet Rise founders, philanthropists Peter and Cathy Halstead. They have accomplished this with imagination, flair and artistic sensibility. "We wanted sculptures that fit the land, to annotate the music, connect with the sky, illustrate the sense of working with the land," says Peter Halstead, a musician, poet and collector of 17 of the world's finest pianos, many housed in state-of-the-art facilities at Tippet Rise. 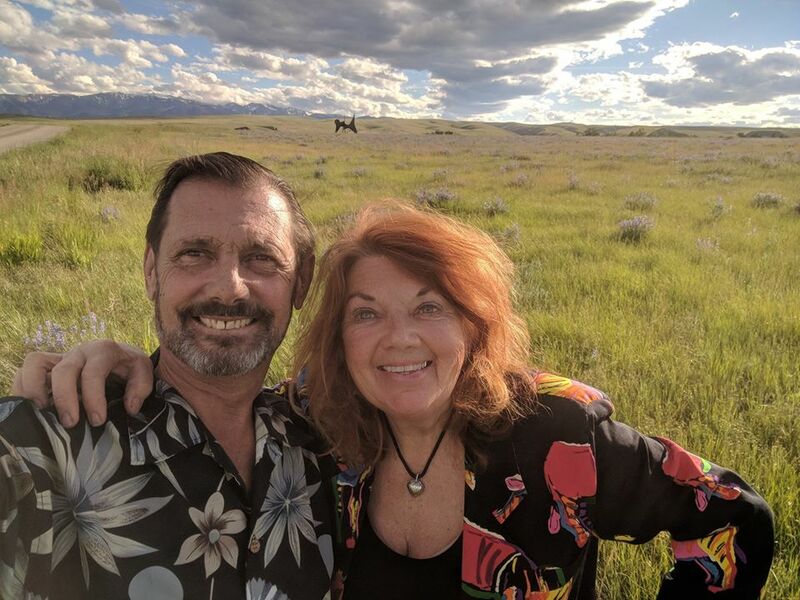 Cathy Halstead, an accomplished artist, contributed her own flair and contacts with the art world to complement her husband's talents in their remarkable achievement. explore space, and the crucial component of connecting to land and roots. 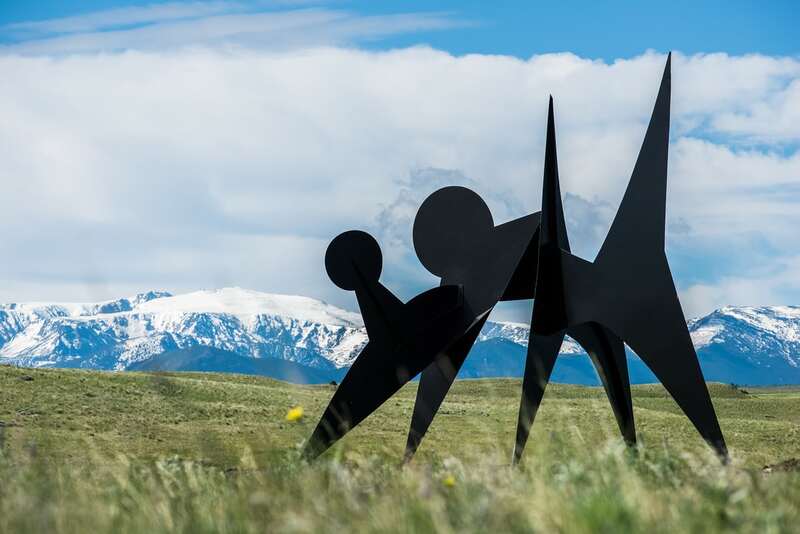 TIPPET RISE embodies a medley of the couple's affections -- love of landscape, travel and classic music, with a significant nod to contemporary art. In fact, the couple considers their unique arts and music venue a metaphor, "where the synergy among music, landscape, sky and art makes....a kind of poetry," says Peter. A TOUR IS recommended. Knowledgeable guides enhance the two-hour venture, which stops at a half-dozen pieces of art, with short hikes to get closer and take photographs. and loved ones from all over the United States, celebrating her birthday. UP NEXT: Celebrate family with us, when we present a short essay -- long on photos -- on the value of family and the bonds of clan and friendship. Remember to explore, learn and live and catch us each Friday for a new post. Fine piece. It sings, like the creation of these generous benefactors. We received a gift of tickets when our hosts sacrificed theirs last weekend, knowing we might not be back here any time soon. Felt transported. A marvelous evening of unparalleled beauty. Wonderful, magical place. And lucky you to live right there. Signed up for art tour next week.